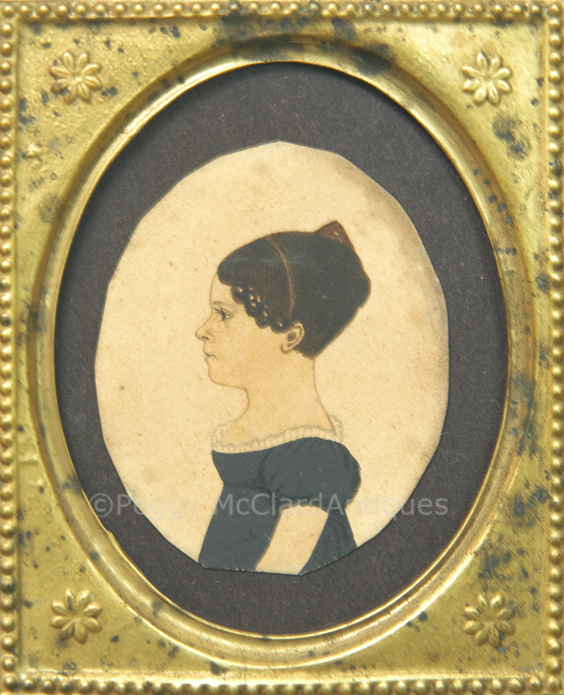 Lovely 19th century American School watercolor folk portrait of a young lady (likely 16 or 17 years old) shown in profile. She has black hair, pulled to a knot at the back of her head which is held in place by a tortoise shell comb, a headband and tight curls that frame her face. Her low-necked black dress has white lace trim, puffed short sleeves and an empire waist. The artist gave this pretty young girl has a very dark brown eye, darkly outlined eye and eyelash and used a light flesh tone with little facial modeling inside of an outline of the profile with either brown watercolor or iron gall ink. She has a distinctly drawn ear with dark watercolor and a strong “c” at the center. A modern label on the back said “Probably by Justus Dalee”. There are some characteristics that signal the DaLee Family, but I can’t find any by any of the DaLee Family that have this distinctly drawn ear. Another reason that I doubt a DaLee attribution is that she sits so that the back of her proper right shoulder is depicted to her back. The DaLee family posed their sitters either straight on so that you can’t see the shoulder in the back; with one shoulder a bit forward so that you can see the front of the opposite shoulder; or with the body straight toward the viewer and only the head turned in profile. The paper has been cut into an oval to fit the aperture of the period brass over wood frame in which she resides. Framed size is 5 ¼” x 4 ½”, not including the wire hanger. The portrait paper is glued to black paper which is, in turn, glued to cardboard. 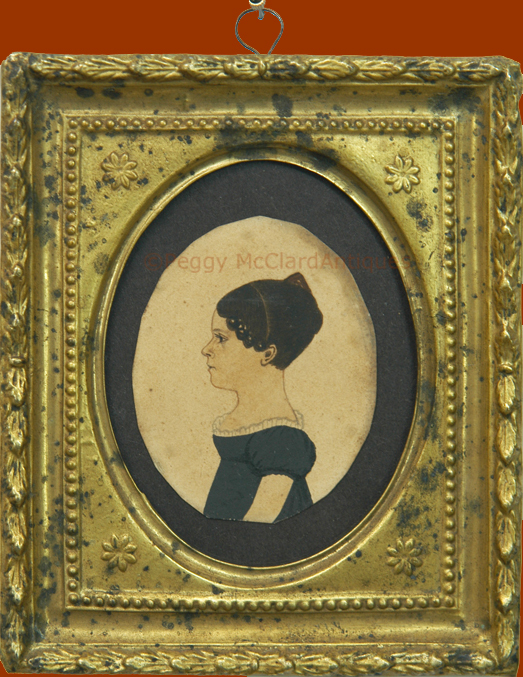 So, she’s not perfect, but she is a wonderful little American folk portrait, circa 1830. I’m not selling her as a DaLee, but if you want to compare her to DaLee Family works, please visit the Folk Portrait Artists and the attributed DaLee portrait of Bathsheba Hosmer also on the Portraits page. She is lovely and a fraction of the price of a DaLee.